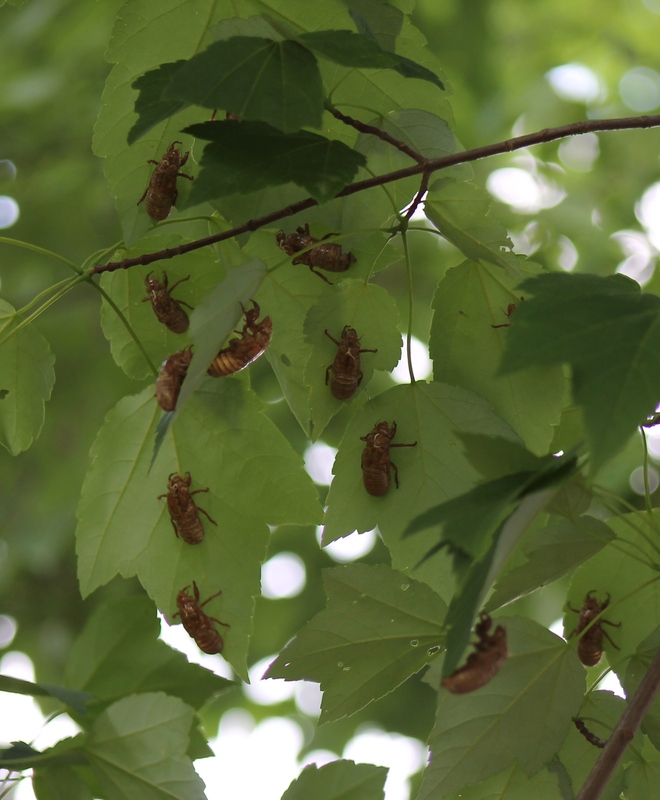 Yes, the cicadas have descended on Woodbridge, Va. They’re flitting through our yards in reckless abandon, colliding with trees, people, and each other. They’re mating with urgency and then dying in heaps. And, they’re CHIRPING (in a way that can only be described with capital letters). It’s a non-stop, brake-squeal of a song that rivals the alien ray-gun sound effects in a 1960s Sci-fi movie. Our dogs and cats are in Petopia, romping in our yards like children at a birthday party. They tease, chase, and bat the poor things, then gorge themselves silly; the ground is littered with slimy, half-eaten egg sacs. It’s like canine caviar, except that when you factor in rug cleaning and vet costs, it’s much, much more expensive. 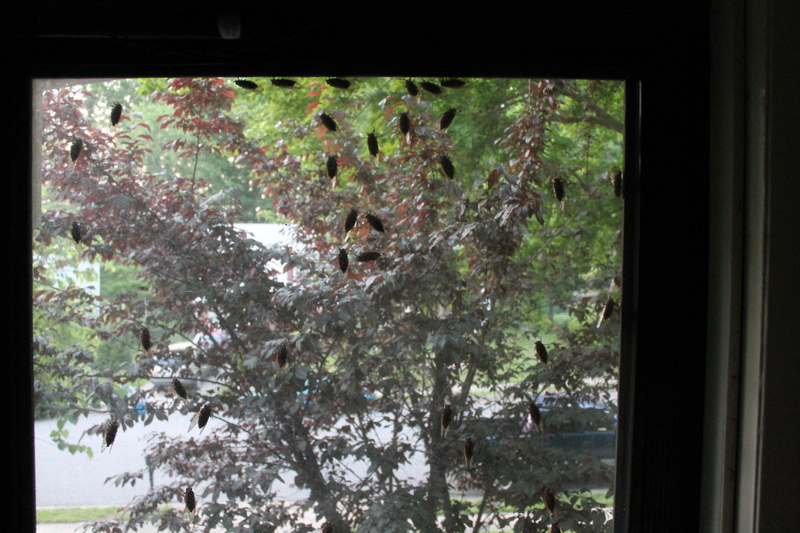 Our streets and trees are covered with empty larval shells, and the fat-winged, locust-like critters are clinging to nearly every other square inch of vacant space in the neighborhood. This morning our front door screen looked like something even Steven King’s imagination couldn’t have fathomed—their beady red-orange eyes (at least I think those are eyes) were staring at me as if their very survival depended on getting indoors. On the up side, they don’t bite, they don’t smell, and they don’t seem to be eating the leaves. In fact they aren’t doing any great damage at all, as far as I can tell. So I must confess, I love it all, from the satisfying crunch of shells under my car tires to the incessant morning sonatas, each day louder than the last. I find it fascinating, just knowing this is a once-in-17-years experience that runs its course in six weeks. It’s one of those things about God that makes me giggle: He never runs out of ideas. Isn’t he lovely, in a bug sort of way? You know, when I look at them up close, they’re actually almost beautiful. Their faces are somewhat cartoon-ish. . .smiling even, and the orange trim around the intricate, gossamer-lace wings matches their eyes. Imagine having that kind of abandon—to live every minute so fully that there isn’t time to worry or seek vengeance (that’s a good thing for some dogs I know), and to add your voice to an ever-growing choir until the whole East Coast vibrates with song. It makes me think, what a blessed species we are, that God gives us more than six weeks to taste joy, and so many more reasons to sing. Imagine what it would sound like if we joined our voices together with such enthusiasm, and what we could accomplish if we focused as intently on fulfilling our purpose. 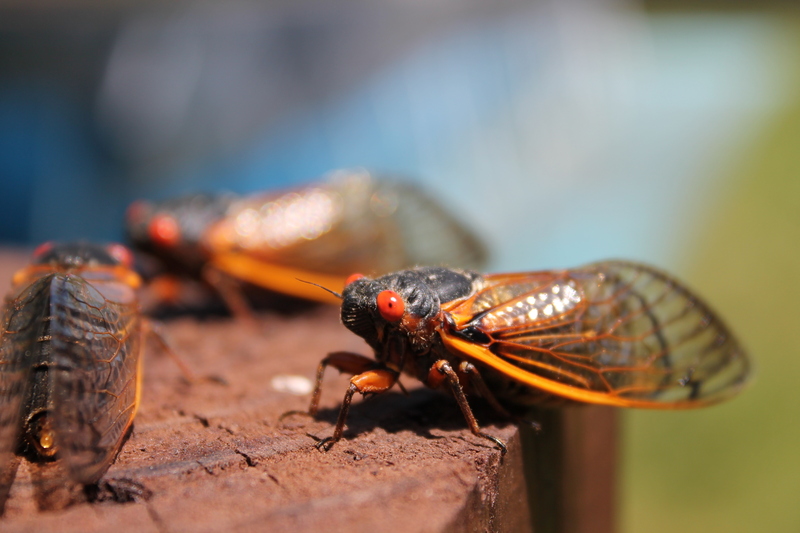 So before my cicada enthusiasm wanes, I’m going to look at these critters with a new attitude, and take a tip from their lifestyle. Are you with me? Sing loudly today. Wake from your slumber and celebrate life! And get that dog in the house. This is Private Charles Heilborn, in New York City to buy a locket for his sweetheart, Rose. He gave her the locket just before deploying to Korea with the 3rd 155 Howitzer Bn, 1st Marines, and asked her to wait for him. She did, but this handsome man was not the Marine who returned to her. One afternoon in Wangu, while he was cooking tomato soup in his helmet, the camp was hit with a barrage of enemy fire. A piece of shrapnel sliced through his head. The doctors said if he’d had the helmet on he would have died. They gave him a glass eye and a metal plate, and estimated he had about 3 years to live. He proved them wrong (fortunately for me as I was born 11 years later), but it was a great sacrifice to keep living. He suffered from headaches and chronic pain until his death at age 64. However, if there’s anything his nine children would agree on, it’s that every day for the rest of his life, he’d have gladly returned to his beloved Corps and given more if they’d take him. Thank you Dad, for your sacrifice, and for raising us to love this nation, our veterans, and the freedom they fight for. You are my Memorial Day Hero. Who’s your hero today? Tell us a story! This week, I’m a small fish in a huge, eclectic pond. I’m meeting LOTS of writers here at the Blue Ridge Mountain Christian Writers Conference. There’s a man who is working on a parenting book, a “garden whisperer,” and even a woman with a split personality who is writing about herself. (I didn’t have the nerve to ask if herself knew about this). Anyway, I love them all, and I could listen to them talk all day because hearing writers talk about their work is inspiring and fills me with hope. But when the other writers question me, I falter. You see, I still have trouble answering that Big Question: WHAT DO YOU WRITE? That’s not enough. Do you write suspense? Historical? Romance? Historical romance? So, speculative fiction? Contemporary? Dystopian? Not really, I say, too cowardly to ask what a dystopian is. I write short stories about seeing God in the everyday things. Ahh…that would be devotionals or inspirational fiction. Christian living stuff. Well, yes, but I particularly want to tell people’s stories. So, you’re a ghost writer. I’m a contemporary, non-dystopian, but inspirational fiction writer who ghosts. I’m going to need a longer business card. Snip. Snip. Snip. With each pass I consider the events leading to this day. The decision to step into a strange new world. Pleading with my husband to take just the right photograph. Agonizing over the quote, its placement, spatial relationship between all the elements, colors and fonts. Fighting with Photoshop because it won’t let me add text—the program’s most basic function, and YES DEAR, I KNOW HOW TO DO IT, IT JUST WON’T! Apologizing for my outburst when I realize I was working on an 805-inch canvas instead of an 805-pixel canvas…details, details. Yes, dear, that would be 67 feet worth of details, requiring a text point size of at least 2,700 to be visible. Hitting “send” to engage the printer. Waiting a whole three days for the express shipment so they get here in time to take with me to next week’s Christian Writers’ Conference in Asheville, NC. Trying not to look like a silly child when the truck pulls up. Snip. Snip. Snip. Two hundred and fifty Cards. I lovingly pick up each one, turn it over, and shave one-sixteenth of an inch off the side where I forgot to factor bleed space. Rookie Mistake. Still, I’m elated, because as I touch each one, I wonder, who will get this one? Will it launch a story, a relationship, or a life-long friendship? This is a most exciting time. These are my business cards. My life will never be the same. Snip. Snip. Snip.